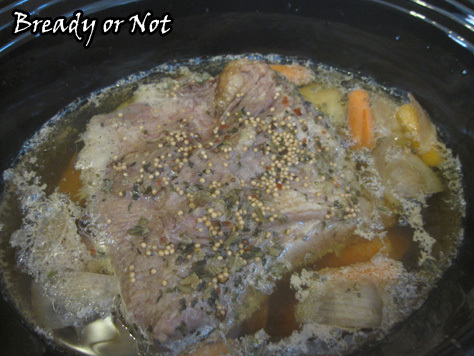 Corned beef in the slow cooker. This is by far the easiest, tastiest way I’ve found to make this dish! 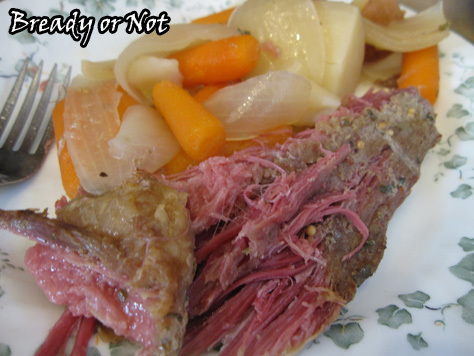 It’s become an annual tradition for me to make a St. Patrick’s Day corned beef brisket. 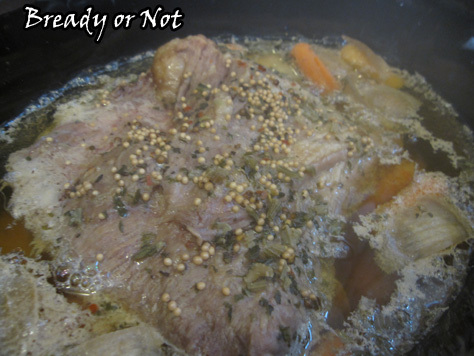 I boiled the meat one year, and baked it in the oven the next. It’s turned out delicious both ways (though the quality of the Kroger-branded brisket was lousy with fat) but I found that the crock pot is the best way to go. No watching the pot for boil-overs! Plus, it makes side dish veggies at the same time. I dislike celery so I replaced the cut stalks with celery flakes, which provides flavor without the icky texture. You’ll want to cut the potatoes into big chunks that are all of like size. It’ll depend on the size of the potato if you need to cut them into halves or quarters. I had pretty big potatoes, so I did quarters. Do get red potatoes, though. They cook all day and get tender, not mushy. 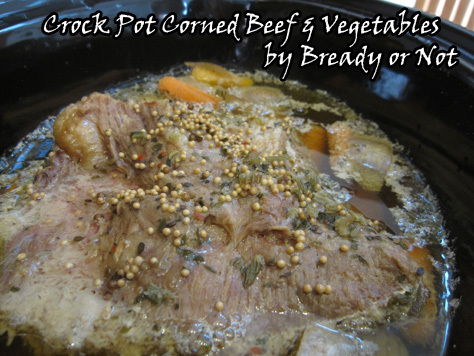 Make this along with the Mini Muffin Irish Soda Bread from last week, and your St. Paddy’s Day meal is all set! … Oh, you want dessert? How about these Irish Coffee Blondies from a few years ago?